There are plenty of ‘money can’t buy’ experiences and to racehorse owner Ashley Gilbert one of those would be to see his horse Zarhron compete on Australia’s richest race day. And while money can’t buy you a spot in the $1.3 million The Kosciuszko, a $5 ticket can win you one – so Gilbert has over 20 and counting with a few more to come before next Friday’s deadline. Owner Ashley Gilbert with Zarhron. The former NRL star, who played nine seasons with the Canberra Raiders, knows the most likely way his nine-year-old gelding, trained at Cowra by Andrew Molloy, will find his way to Everest Day at Randwick on October 13 is through him, or someone he knows, winning the right to a slot. But it hasn’t stopped Gilbert, with the help of his daughters, from starting a Facebook campaign – even going as far as asking people to skip their morning coffee to buy a $5 ticket – to help their horse be one of the 12 runners. “It’s such a long shot there’ll be a lot of things that have to go right for it to come to fruition,’’ Gilbert said. “It’s like the lottery but it’s such a great idea with the interest it has created. “We heard other trainers were on Facebook and trying to get their horses out in the public. And so Zarhron – Journey To The Kosciuszko was born. A winner of the past four Cowra Japan Cups over 1200m, this year with 63kg, Zarhron is the Gilbert family’s pride and joy with 12 wins from 36 starts. 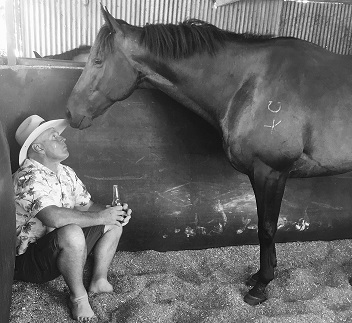 Gilbert, who lives on a farm around 40km from Crookwell on the NSW Southern Tablelands, was in Queensland and Zarhron, who he calls the ‘King’, was in the paddock when The Kosciuszko was announced. Three days later he’d made a mercy dash from his holiday, cutting it short by a day, to drive home, deliver the gelding to Molloy, who calls him ‘the champ’, at Cowra and get him into work. “He was always going back for a preparation and he’s probably gone back six weeks earlier than normal,’’ Gilbert said. “He’s been an unbelievable horse to us. “I saw him conceived, saw him born, saw him have his first drink of milk, raised him in the front paddock. It’s only been my family’s hands and Andrew’s hands on him. The horse is due to step up his preparation with a barrier trial at Wellington on Monday. Does Zarhron have a realistic chance of winning The Kosciuszko? If one of his tickets is drawn out next Friday, Gilbert doesn’t care about winning and losing. Zarhron will be there. It’s all about being a part of it. “I did go as a spectator last year and I said I’d go back again,’’ he said. “I’ve seen every one of his starts and helped saddle him. To have a horse racing on that day and see a $13 million race a couple of races later would be unbelievable.